﻿ Magazine content за Ноябрь 2018 г. This article contains an analysis and description of the approach of German law to the issues of the legal regulation of conditional transactions (art. 157 of the Civil Code of the RF) examined in #Gloss Commentary series and is in essence a comment to a comment. Such an approach has allowed demonstrating how German law solves the problems which arise in Russian law in connection with the interpretation and application of the norms of conditional transactions. In particular, in German law, the issue whether only separate rights and obligations and not the transaction as a whole and not the entire aggregation of rights and obligations under it can be conditioned is not questionable. German law allows conditioning separate rights and obligations. Another pressing and unsolved issue in Russian law is the issue of legal regulation of the time period between the conclusion of a conditional transaction and the occurrence of a stipulated condition. Again, this issue is rather clearly and logically regulated in German law, and such regulation protects the interested party from possible abuse on the part of the other party. Comment to para. 59 of Decision of the Plenary Meeting of the Supreme Court of the RF No. 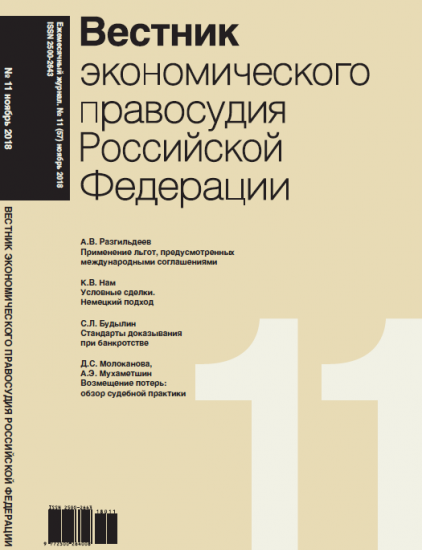 7 «On Application by the Courts of Certain Provisions of the Civil Code of the Russian Federation Concerning Liability for Violation of Obligations», 24 March 2016 The author criticizes the approach supported by the Plenary Meeting of the Supreme Court of the RF, according to which the judgment creditor who has collected an amount of money on the basis of an erroneous court order (according to the general rule) shall not be held liable for its use until the entry into legal force of a final court order in favor of the defendant. The author believes that the privileged period for the claimant can continue only due to the fact that the erroneous court order remains in legal effect and its cancellation (and perhaps the submission of a complaint against it which is subsequently satisfied) creates for the claimant the obligation to treat the collected amount as questionable and, consequently, to be able to repay to the defendant, if the claimant loses in the case, not only the collected amount (capital), but also the interest accrued on it in the amount of the key interest rate of the Bank of Russia. Based on Judgment of the Chamber for Economic Disputes of the SC RF No. 305-ЭС18-413, 4 June 2018 In this case, decided by the Chamber for Economic Disputes of the Supreme Court, the claim of a depositor, who also was a shareholder of the bank, was discussed. The Panel found that the existence of the claim was not proved. Among other things, the Chamber laid down a rule, new for Russian law, in accordance to which there is a hierarchy of «standards of proof» in civil proceedings, and the claims of creditors affiliated with the debtor are subject to the most stringent standard: «beyond a reasonable doubt». Unfortunately, the Chamber’s decision can hardly be called intelligibly reasoned, as far as standards of proof are concerned. It is worth noting that the application of this stringent standard of proof in civil proceedings is at least disputable, including from the constitutional law point of view. Indeed, excessive requirements concerning the proof of existence of creditor’s claim mean that in many cases the issue of fact will be resolved incorrectly — an actually existing debt will be found non-existent because it is not proved under the stringent standard. This tantamounts to a seizure of creditor’s property. The article describes the background and the legal consequences of the so-called Diesel Scandal in Germany and other countries, primarily the US, and explores the question, why it was possible in the USA to make Volkswagen pay comparably high compensation payments to buyers after a short period of time. On the one hand, mechanisms of public law and organizational measures are described in more detail, with the help of which the state enforces the normative requirements for reducing harmful emissions from motor vehicles. However, the result was evidently ineffective, so that Volkswagen was able to succeed, over the course of many years, in deceiving the supervisory authorities with the help of special computer software regulating gasoline emissions of the engine. This, in turn, has led many buyers to buy supposedly green vehicles that do not meet emissions standards. In the second part, the article deals with the question of which claims buyers may put forward to the seller and the manufacturer and how these claims may be enforced in court. The author deals with some specific aspects of the material claim on the one hand, and with the problem of so-called class action suits on the other. The institute of compensation for losses (or, as it is sometimes called, indemnity) appeared in the Russian Civil Code in 2015. The essence of this legal mechanism is that one of the parties to a contract undertakes to compensate the other party for losses that may arise as a result of circumstances specified by the contract. The subject matter of this article is judicial acts where courts apply provisions of art. 406.1 of the Civil Code of the Russian Federation regulating the mechanism of compensation for losses. Analysis of judicial practice demonstrates that, despite the appearance of clarifications in paras. 15–18 of the ruling of the Russian Supreme Court dated 24 March 2016 No. 7, Russian courts still continue to make mistakes relating to applying the rules of art. 406.1. Courts confuse the doctrine of compensation for losses with other civil legal doctrines: compensation for damages, payment for cancellation of a contract, insurance contract, and set-off. There are also some controversial positions on certain issues. In particular, these relate to the possibility of application of art. 406.1 of the Russian Civil Code to legal relations arising prior to 1 June 2015 and legal relations under state contracts. However, it is necessary to note that there are many judicial acts in which courts demonstrate a correct understanding of the legal nature of the doctrine of compensation for losses.